Cloud Computing Service Models and Deployment of Cloud Models is one hand is quite interesting and on the other hand is very useful to know to reduce the cost. For example, for a small business website with less than 500 visitors per day which needs SSL certificate, we would recommend Heroku Cloud, which is a Platform as a Service (PaaS) and will cost nothing, for a starting self hosted WordPress; App Fog or Red Hat OpenShift can be good option, but for a medium to high load blog, just take the example of this website as a medium sized article and guide centric blog, a scalable, optimized, managed IaaS or at least managed aPaaS is needed with full CDN support and load balancers. We think more than 7 minutes downtime in one single month, on total is the maximum lower limit. The importance of understanding the Cloud Computing Service Models and Deployment of Cloud Models returns a big fact – Return of Investment. We have described the theories on various Cloud Computing Service Models and Have shown the deployment through the guides and tutorials. This article consolidates the theories to practical application. I honestly do not know, whether more easily the basics of Cloud Computing Service Models can be explained. Software as a Service (SaaS) : Software as a Service (SaaS) represents the portion visible to the end user, accessible through the Internet. It is deployed by the use of any software applications which residing in the cloud, relieving both the responsibility of maintenance that the need for high-performance hardware platforms for the user. It also simplifies the task of updating and testing by the developers. 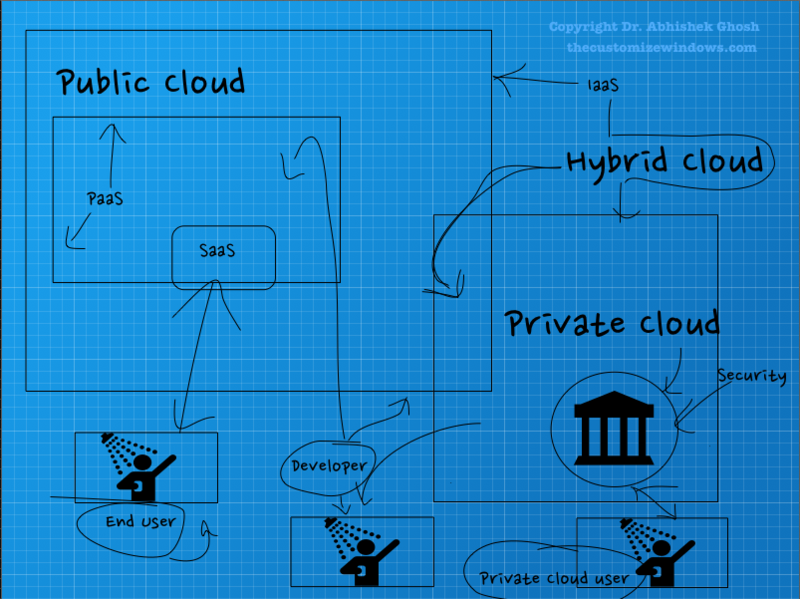 A cloud application can be defined as a composition of other applications offered as a service, following the principles of SOA . Similarly that happens with the traditional development, the programming of the applications using high-level API standard is easier, minimizing errors. However, flexibility is sacrificed, preventing fine optimization. An important factor to consider for a successful SaaS is the quality of Service Level Agreements (SLA) associated to convince the user to give a solution to the counterpart in Desktop Application. Platform as a Service (PaaS) : Platform as a Service (PaaS) is the supply of the development platforms and the execution is accompanied by a set of standard APIs for easy programming and interaction with the underlying layers. Service customers are therefore software developers, who can enjoy several benefits, such as automated load balancing and scalability, remote collaboration and the ability to integrate additional services on request. The most important advantage is reducing the time and cost of development, overcoming the need to carry out a engineering from zero. Developer do not need to worry about the underlying infrastructure and the complexity, but can focus on innovation and core business of the company. Infrastructure as a Service (IaaS) : The service includes the provision of infrastructure resources of different types, such as execution environments, storage or network resources. The use of the the higher levels for the construction of the related services is not substantial, but ensures the tools for a development to be easier and cheaper. Resources are usually offered to the user by using virtualization technology. The creation of virtual machines (VM) allows the delivery of various services such as Desktop as a Service (DaaS). All of the above are practically examples of Public Cloud Computing. Digest the above first if you are new to these terminologies. Private Cloud Computing is quite complex and costly. You can search with Private Cloud Computing in the search box on this website for many articles and guides. 95% will not need Private Cloud Computing. This Article Has Been Shared 2896 Times! What Cloud users need to know are legal aspects of the concept, Security and Privacy and Copyright and Licenses. We have answered the most important questions. The biggest challenges for cloud computing are privacy and compliance requirements and maintaining information security. Cloud should be integrated with other trends. Basics of Cloud Computing is possibly mandatory to understand by any level of user today for the sake of Privacy and Security. OpenStack Cloud Tools Python Packages are quite easy to install python using the pip command. We have shown how to install for Linux server. Move WordPress Administration to different server and allocate a Sub-Domain for better security and higher performance tweaks of the front end. Cite this article as: Abhishek Ghosh, "Cloud Computing Service Models and Deployment," in The Customize Windows, December 9, 2012, April 21, 2019, https://thecustomizewindows.com/2012/12/cloud-computing-service-models-and-deployment/.